Hinduism Indian will bring you importance of all Hindu festivals. Simply it is all about Hinduism. Bheeshma Ashtami is on Saturday, 4th February in 2017. Bhishma Ashtami Snan is observed on the Magh Shukla Paksha Ashtami eighth day of the Magh Month as per traditional Hindu Lunar Calendar. The Snan or bathing on holy rivers on the day is considered highly meritorious. 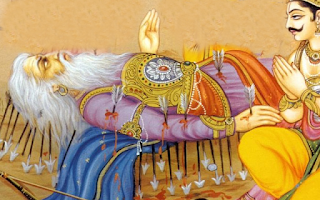 Bhishma Ashtami is observed in the Magha Maas which will occurs during the January or February. People also perform Bheeshma Ashtami Tarpan (rituals dedicated to dead) on the day on river banks. It is dedicated to Bhishma and forefathers. Some people observe fast on this day Sunrise to sunset. The story behind Bhishma is, Shantanava is the king of Bharat Kandh. Bhisma is the son of the King Shantanava and Ganga Devi. Actual name of the Bhishma was Devavratha and another name of him Gangeya beacuse he is son of the Ganga Devi. As he made a promise (Bheeshna Pratigna) to his father that he never marry in his life because of his father second marriage. After the promise Narada Maharshi named him as Bhishma. In favor of Bhisma's promise his father gave boon as Bhisma's death is on his own hands. After the fathers death bhishma decided to do marriage of his brother Vichitra Virya. Bhishma selected the daughters of Kasi Raju they are Amba, Ambika and Ambalika for his brother marriage. But Amba she want to marry other king. So, Bhishma Sent her back to the king. But king rejected her then she came back to Bhisma asked him to marry her. bhishma said as he promised to not marry so he said no. Then Amba went to Parushurama for help but she didn't get. After that Amba prayed for years to Lord Shiva. Lord Shiva asked for her wish she asked to get death of bhishma because of her, So he gave her the oath, In next birth she born as Shikandi. Shikandi was born as lady at young age she became man. Bhisma brothers son's were Drutharastra and Pandu Raju. Bhishma is great grand father of the Pandava's sons of the Pandu Raju and Kaurava's sons of the Drutharastra. The meaning of vedas, upanishat were explained to Pandava's in the form of stories by Bhishma. In all dharma great dharma is saying the truth. i.e in all sins great sin is saying lies. people should talk to each other speak softly. People who would like to get rid of the putradosh (lack of a child) find this day as the most significant. Performing a Tarpan on this day will eventually consummate the fast kept by people in this regard. 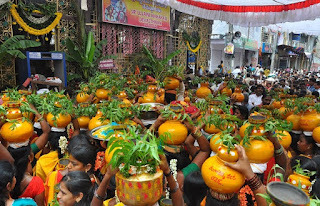 In July there is big festival Bonalu along with other festivals.